The "Armourfast" range (previously part of the Hät consortium) is tailored to the wargaming community and offers two complete, simplified, kits in a single box. 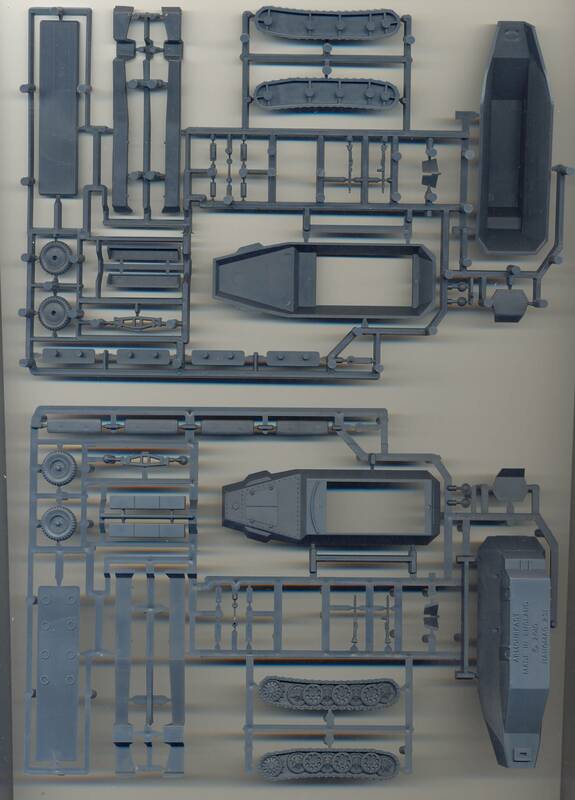 Parts count is limited and the manual is reduced to a single "exploded" drawing on the back of the box, which make for very fast assembly for the wargamer with limited time/funds and a large army to field. The grey plastic in this kit is quite soft; something in between the usual styrene and vinyl, which is slightly annoying when sanding or scoring. The plastic reacts very (!) well to MEK however, but paint adherence is low. 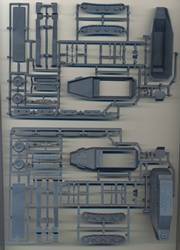 The kit represent an Ausf.C with riveted hull, unlike the boxtop. The rivetting is convincingly done. 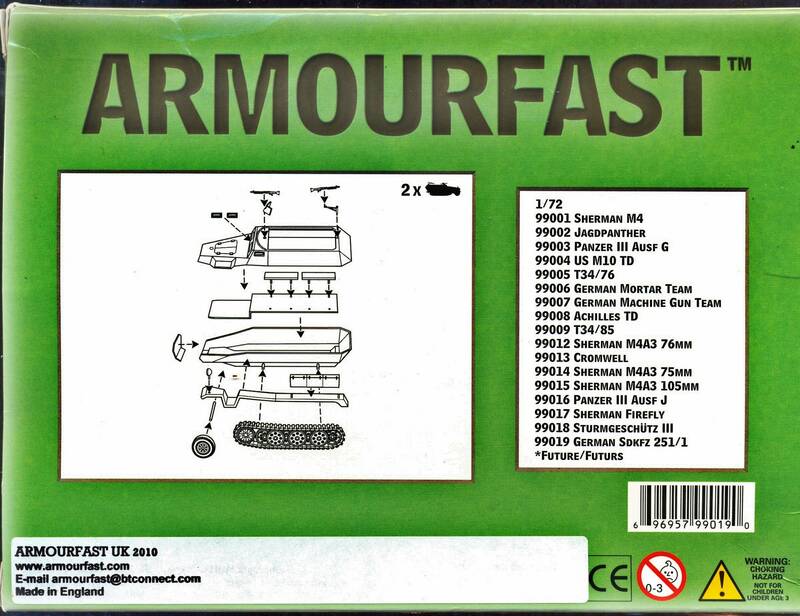 This is the third Armourfast kit I have built so far, and I must say that I had become used to a slightly higher standard. - No locator tabs are given for the separate (!) visors, the fenders or fender boxes. Make sure to mount them in the correct spot, which - especially for the fenders and fender boxes - is more or less guesswork. - The visors are good, but take care: there are two types (the manual does not state this) and it is easy to mount them upside down. - You get two headlights, but no Notek. - No muffler is given, which is a prominent feature. - 4 very simple benches (without backrest) are given, but non for driver and co-driver. I might guess that most wargamers will fill this kit up with troops, so it will become less noticeable. The benches have no locator tabs. - you get a spare part, that I don't know where to put as I couldn't figure out what it represented. 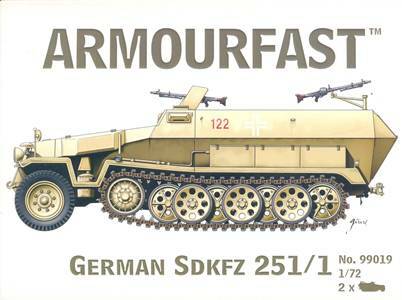 - tracks are, as usual for Armourfast, very simplified, but the representation of front wheels and roadwheels for the tracks are nice. - the 2 MG42s actually have good detail, but lack the handgrip and ... the one for the rear mount (with locating peg) is cast upside down (i.e. with the attachment to the swing arm on top of the gun). A plus is that the suspension of the kit is far better than the drawing/manual would let you expect. After I had finished the kit I felt it didn't quite capture the look of the real vehicle and measured it against plans in . Furthermore, the engine hatch is far too tapered (its sides are parallel to the sides of the engine deck, which shouldn't be like that) and the engine deck itself is far too slender. All this results in a kit that has an anaemic look, being longer/narrower than it should be. 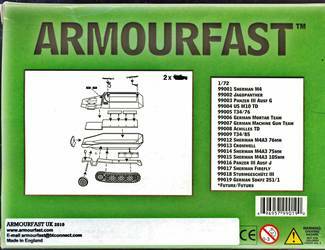 Sample kindly provided by Armourfast.